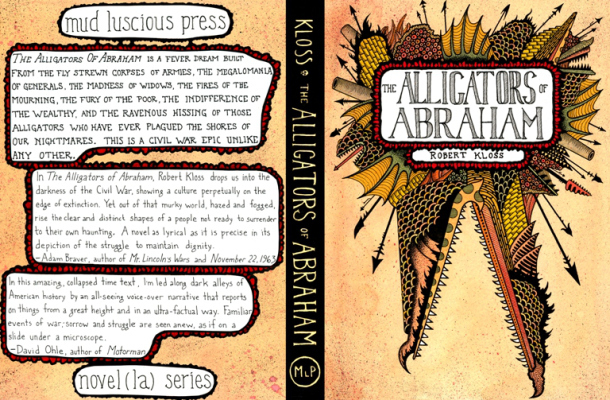 Below is a list of songs that Robert Kloss has recommended for his novel, The Alligators of Abraham. Hopefully the early pages of my novel mirror the enthusiasm and optimism of this song, confetti-strewn streets, marching bands, a kiss stolen from the farm girl down the road. There’s a maniacal drive to this perfect tune which seems to fit soldiers marauding field to field, from farm to farm, burning buildings and butchering hogs and slaughtering each other. Late in Book I a general is sent home with frayed nerves. And he sits and raves and broods, reflecting from his growing madness on everything he has ever loved and lost. Meanwhile, the nation reflects on the loss of its murdered president, touring his embalmed corpse from town to town. In my book, loss does not heal, it deepens and festers and blooms into madness and fires. Here characters wander, scarred and ravaged, drinking gasoline and turpentine laced concoctions. And then there is an alligator plague. I can’t think of a better piece of music to herald the coming of chomping and ripping and shredding and hissing and thrashing and screaming. There’s a great dense iciness to this track that seems perfect for the early pages of book three, which take place on an unnamed icy locale. And of course there’s something of a deranged quality to that iciness, as befits a section of pages that begin in optimism and love and end in ruin, delirium, atrocity. When I listen to this glitchy-raving track I think of millions of newly lit television screens and men wandering blackened streets with no more sense within their minds than the buzzing of confused dying bees. They wander into walls and walk in circles and they gesture to the heavens, babbling gibberish. The title of this track really does it for me. When I think of a ruined city I think of alligators and char and TV wires and flatbed trucks, which makes it the perfect soundtrack for the end of my novel. Robert Kloss‘ novel, The Alligators of Abraham, arrives Nov. 15. Reading the Groove: Maria McKeeIn "Reading the Groove"
Talking with Furniture: Emily St. John MandelIn "Talking with Furniture"
Great Moments in Popular Music, in Motion: Justin Bieber, My World 2.0, “Baby” by Manjula MartinIn "Music"